Breisacher and Garrigue explore the timeless fun of gift exchange. Neighbors Caveboy and Cavegirl are best friends who do everything together. The pair shares interests in pet racing, stone tossing, painting on walls—a joy shared by all children since the very beginning of time—as well as their birthday. 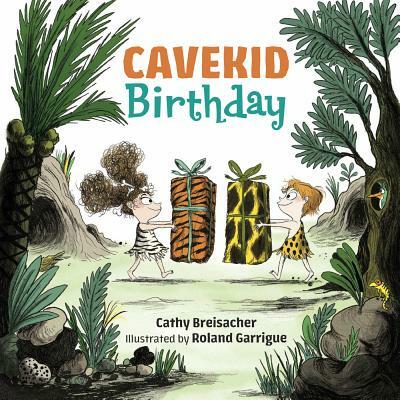 As it approaches, Cavegirl becomes frantic to make the perfect gift, but a mishap involving her pet bear sends her to Caveman's Collectibles to pick out the perfect present. Since money has yet to be invented, Cavegirl trades her tools for a box. Caveboy also considers the perfect gift before trading his precious rocks for…a box. The two best friends make the best of their gifts, but eventually it's back to Caveman's Collectibles for another trade. In exchange for their things, they do some gnarly interior decorating for Caveman—money may not have been invented yet, but paint, ladders, and balloons are readily available! The scratchy line-and-color illustrations share an aesthetic with The Flintstones, with the uniformly pale-skinned characters sporting hide clothing and bone accessories. The message will resonate with generations of readers—the simplicity of a box combined with imagination crosses time and gender. However, the protagonists' binary names are not inclusive of gender fluidity. The faux primitive grammar ("Me like….Trade good") gives character to the dialogue but may also confuse emerging readers. Book sweet.